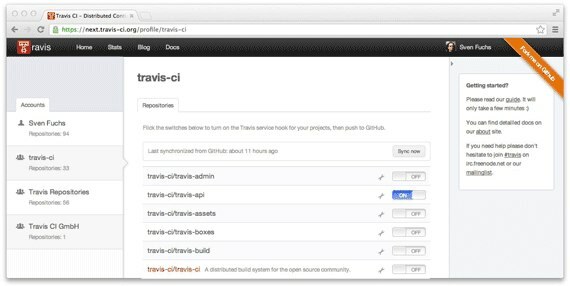 If you think about Travis CI, the web client is the face of the project. You look at it a lot. The “live” nature of our UI, updating the repository timeline as new builds come in, streaming the logs to the browser while a test suite is being run, updating job queue etc. has always been a great asset for Travis CI. … and the “Mac OS X style desktop application” metaphor has proven to work quite well over time. At the same time we are all aware of the issues that our client had over the last few months, especially since traffic on Travis CI has exploded. We are now running about 10,000 builds a day for nearly 25,000 repositories and our old client could just not hold up with that. Especially in situations where our queues had run full and other, seemingly “unrelated” issues occured and the whole client just stalled on Chrome. On top of the scalability issues our codebase made it pretty hard to fix things and add new features. Instead, one had to fight with really old library versions that could not be upgraded easily, a ton of work-arounds and even things like a slow asset compilation pipeline. Even though the client as such was still great, people became increasingly unhappy with the issues it started to show. And rightfully so. We felt just the same! So today we’re really happy to announce Travis CI’s next generation web client. The new Travis CI web client is a complete reimplementation of the proven feature set of the last version. Development started four months ago and a huge amount of work has been put into it over the last few months. It is currently running on https://next.travis-ci.org and we will keep the old version running on http://travis-ci.org for a short while until the new one has proven under higher load and remaining issues are hashed out. With this new version our main goal was to reimplement the same, well known and battle tested functionality that the old client had, but make it based on the latest versions of ember and ember-data, improve its performance, overall stability and usability. We are very happy that this goal has been achieved. The new client feels much more snappy and performs quite well even in situations where our queues see lots of traffic and start backing up. We have never been very religious about this but there always were good arguments that made us want to move away from the hashbang URLs that Travis CI has started with (and frankly, worked great despite using them). This yet has to be used for other interactive features such as turning service hooks on/off and synchronizing data from GitHub. We have also put in a significant amount of attention to further iterate on the look and feel. Especially when running on smaller screens the old client was not really great to use. We have now tweaked font sizes, widths and margins and made good use of css media queries to respond to different screen sizes gracefully. If you’re into CSS then you might notice that the service hooks on/off switch is done entirely in CSS without using any images. 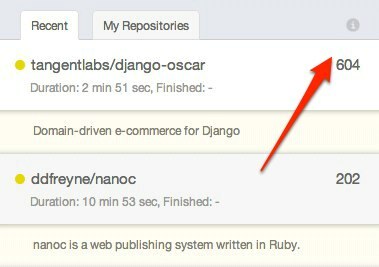 We already prepared integrating this client for Travis CI Pro so you can expect it to be ready soonish. Travis CI Pro is still in private beta, but if you are interested in trying it out then drop us an email to support@travis-ci.com. The new client is built on top of the latest version of Ember.js, instead of the pre-alpha Ember version that actually still was called Sproutcore 2.0 at that time. It uses the much faster and lighter Ember Data for storage, instead of the old and very, very crufty Sproutcore Datastore. And it uses the new, shiny Ember Router, not our own port of the old Sproutcore router. All the improvements that have gone into the underlying Ember libraries combined with the removal of hackish workarounds on our side make up for tremendous improvements not only in terms of speed and stability, but also ease of development and way more consistent code everywhere.